Unsprayed Organic Practice (not certified) Raw Texas Junior Mammoth Papershell Halves. We ship halves, not pieces, for best longevity and freshness. 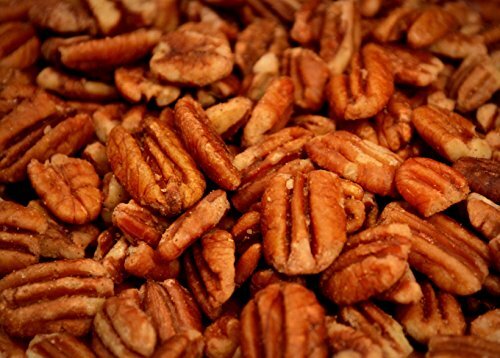 We work hard to keep our pecans perfectly fresh, bag them and then ship straight to you. We guarantee they are fresh and wonderful. Let us know and we will address any problems ASAP.Support our startup sustainable permaculture three generation small family farm. Gluten and peanut-free, Non-GMO, Vegan and Paleo. We process only pecans, walnuts, almonds, pumpkin seeds and sunflower seeds in our small farm commercial kitchen. 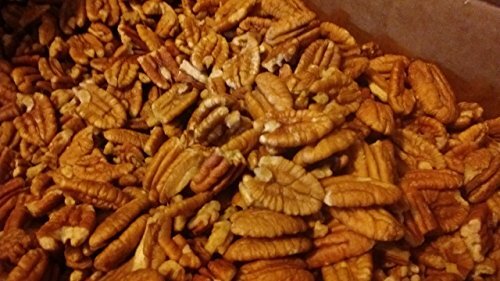 Fresh Shelled Texas Native Pecan Halves - Certified Pesticide-free and Wild-harvested, Bulk 5 Lb. Raw wild-harvested Texas native pecans, certified pesticide-free. Cured for best flavor, then kept at ideal temperature and humidity (not frozen) in shell. Shelled and shipped only as needed for maximum freshness. We ship halves, not pieces, for best longevity and freshness. Support our startup sustainable permaculture three generation family farm. Gluten-free, Non-GMO, Vegan and Paleo. Texas Native Pecans are the only thing we work with in our farm commercial kitchen, so no peanuts or other nuts ever come in our shop. 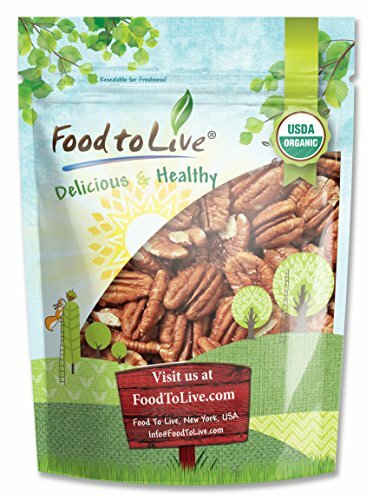 THE FRESHEST PECANS YOU'LL FIND ONLINE Certified Organic If you're looking to buy pecans online, then these certified organic nuts are your best bet. In a market saturated with GMO-grown pecans, this rare treat gives you a wholesome fix of minerals, vitamins, antioxidants and fiber that is completely free of chemicals or preservatives. Safeguard your health with the finest organic pecans. No More Stress Find cracking pecan shells to be a nerve-wrecking task? Then these carefully-shelled raw pecans will make your life so much easier! Quickly bake a pecan pie, whip up a tasty salad, bake up some muffins, or enjoy a nutty snack without any of the hassle. Here are the incredible health benefits of pecans: - Oleic acid helps to check cholesterol levels. - Beta carotene, lutein and zeaxanthin promote eye health. - Contain calcium, copper, iron, magnesium and selenium. - Vitamin E and zinc improve the appearance of skin. - Fiber and protein increase satiety to prevent overeating. 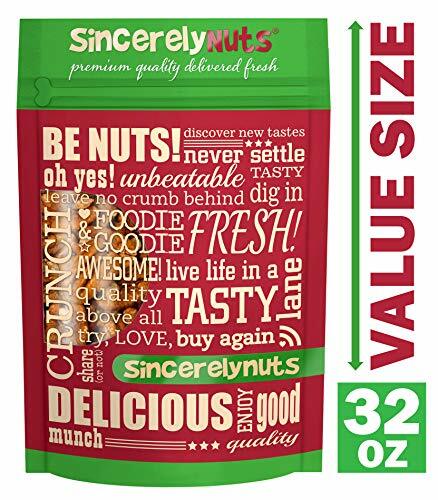 Steer away from harmful chemicals with these shelled organic raw pecans and enjoy amazing freshness in every bag. Click 'Add to Cart' now! Most organic nuts are sprayed with organic-approved products. These are not only certified organic, but not sprayed at all. Natives have the richest pecan flavor. Texas family orchard grown. We carefully soak and low-temperature dry them to keep them raw (below 105F by Weston Price guidelines) and make them crispy and delicious in our peanut- and gluten-free, non-GMO state-inspected commercial kitchen on our small family farm where we use no chemicals and work toward soil-restoring permaculture. Always fresh. No distributor warehouse time. We sprout them ourselves in small hand batches. Always Fresh. Kept in ideal conditions, shipped straight from us. Date bagged and best by on each bag. 1000's of happy customers. Please don't be an anonymous stranger. Contact us right away with any concerns or questions and we will resolve it with you. The buttery smoothness of the jumbo pecans and light sea salt add crunch and depth to sweet or savory dishes. 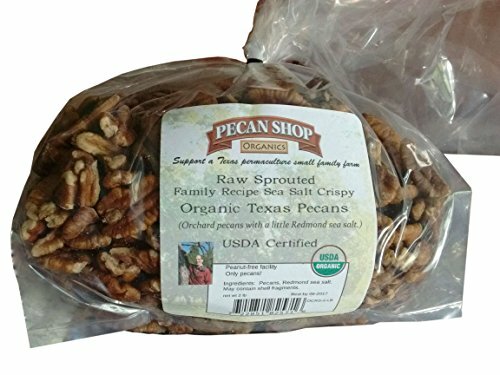 These certified organic Texas orchard pecans are soaked overnight with filtered water and a little Redmond sea salt. 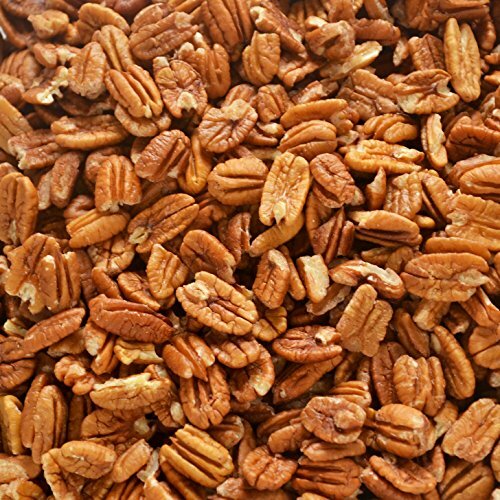 Soaking removes phytates and releases enzymes, making these pecans easy to digest and tender. We then crisp them, keeping the pecan below 105F, bringing out their buttery, sweet flavor while preserving oil, vitamins and enzymes for a longer storage life. The beautiful zip-resealable package makes a great gift, too. Our recipes are made by hand on our small family farm and are raw, vegan, gluten-free and activated (Another term for soaking/sprouting nuts). We ship only pecan halves (not pieces) for maximum freshness+longevity.